FQB "Besotted" Collection is all about the love that we have for someone or something!! Love is such a powerful emotion that grabs our attention every bit as much as the colours of this digital kit! Beautiful reds, soft pinks and a bold black work together to convey these strong emotions into our cards, mini albums and scrapbook layouts. Creating with this kit can take you on so many adventures from anniversaries, Valentine's Day, the love you have for your closest friend or even your pet! Stroll through the elements and background papers and let them lead the way to your next heartfelt creation! 6 Arrow-shaped word tags that can point you in the right direction...which one is just perfect for what you're trying to highlight? 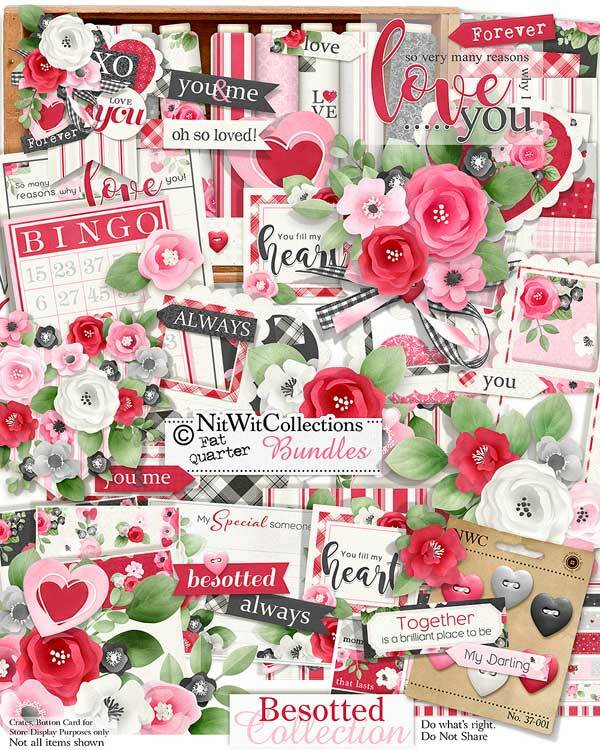 1 Banner cluster that is filled with beautiful florals and sentiments....a perfect main element for your cards, mini albums and scrapbook layouts! 1 Horizontal border with the soft, sweet message - "You Fill my Heart"
6 Heart-shaped buttons....can I get a little Love?? 3 Floral clusters designed in the shape of a heart. Not only eyecatching but meaningful as well! Which colour pattern works into your creative vision?? 2 Flower clusters that are of a medium amount of fullness....you have so many options!! 1 Label - "Together is a...."
7 Ribbon strips....digital washi tape at its finest! 1 Sentiment digital stamp - "You Make my Life Better...."
1 Sentiment cluster - "You Fill my Heart..."
1 Sentiment cluster - "Valentine Wishes to You"
2 Sentiment clusters that have the word areas left blank...what will you say?? 1 Sentiment square - "You Fill my Heart"